My Lean Six Sigma, that began in 2015, team and I have made a lot of progress and have kept on schedule for all milestone deliverables. My teammates have commented to me their appreciation of my involvement. They have nicknamed me the “voice of reason” and the “guardian of the charter” for keeping the team on track and reminding them of our scope and goals. I’ve also had the opportunity to use my creativity and design skills in things like presentations and helping us visualize concepts that are difficult to grasp. At one point during a meeting I even drew the face of a smiling sales rep on the white board to help us be reminded who our process’s end customer was. It was a fun time, and the team said even that little thing was helpful in focusing our efforts. This year I completed the Sigma training and I am wrapping up the final steps of the project. 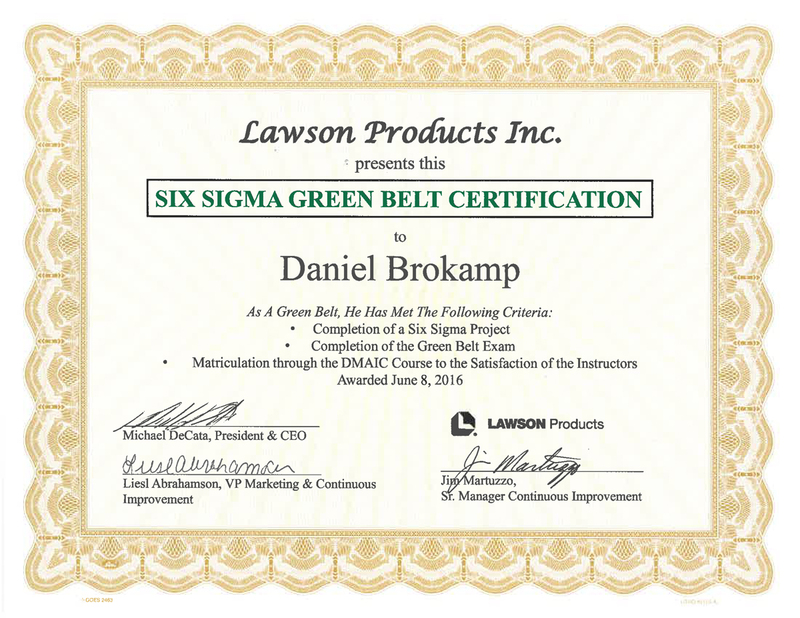 After receiving a high score on a rigorous examination, I earned my Lean Six Sigma green belt certification!